A continent can be defined as one of the very large landmasses on the surface of the earth. Comprising many countries, continents are mainly surrounded by sea. The earth is divided into seven continents; however, there is great variation in the size of all these continents. Asia is the largest continent, followed by Africa, North America, South America, Antarctica, Europe, and Australia. 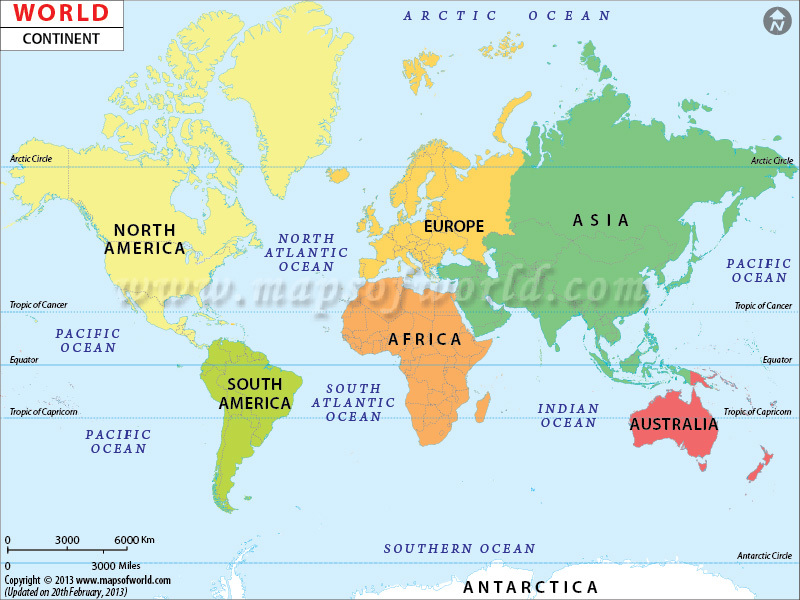 At times, the two continents of Europe and Asia are considered a single continent, Eurasia. The continental landmasses are concentrated more in the Northern Hemisphere than in the Southern Hemisphere in terms of area. This downloadable map shows all the seven continents, marked in different colors. Each continent is clickable and then leads to the detailed map of that particular continent. In addition, the map shows all the oceans. The Isthmus of Suez connects Africa and Asia, while the North & South America are joined by the Isthmus of Panama. These isthmuses are considered quite narrow if we take into the account the area of the landmasses they join. No isthmus or sea separates Asia from Europe, which explains the reasoning behind the concept of Eurasia, that is Europe and Asia as one continent. This is one of the six-continent models of the world. This view, however, is only popular in Japan, some Eastern European countries, and Russia. The continents North and South America are considered separate ones. However, in earlier times, they were considered a part of a single continent and were collectively referred to as America. Still today, a few South American countries consider the two to be a single continent. There's another theory concerning the division of the continents, called the four-continent model. As per this theory, Africa, Europe, and Asia are considered a single continent and are collectively called Afro-Eurasia. And, thus, the total number of continent reduces to four, namely, Australia, Antarctica, America, and Afro-Eurasia. Other continental divisions include supercontinents and subcontinents. Supercontinents are those landmasses that have more than one continental core or craton. The contemporary instance is Eurasia. Other examples include Rodinia, Pangaea, Laurasia, Kenorland, Gondwana, and Columbia. Subcontinents are those parts of a continent that fall on tectonic plates different than the rest. Arabian Peninsula and the Indian subcontinent are the best examples of it. These are those areas of the crust of the continent that are to a large extent sea-covered. For example, Zealandia, which is buried under the sea. Some islands drift off from the main continent body. However, they are too small to be called continents and hence are called microcontinents. The largest microcontinent is Madagascar. The most populated and the largest continent on the planet is Asia. Spread over an area of about 17,212,048 sq. miles (covering 8.6% of the earth's total surface area), the continent is situated in the northern and eastern hemispheres. The second largest and the second most populated continent in the world is Africa. It is bordered by the Indian Ocean to the southeast, the Atlantic Ocean to the west, the Mediterranean Sea to the north, and Suez Canal & Red Sea to the northeast. The continent has 53 countries, not including the disputed territory located in Western Sahara. The continent is present in the western and northern hemispheres of the earth. It is surrounded by South America and the Caribbean Sea on the southeast, the North Pacific Ocean on the west, the Arctic Ocean on the north, and the North Atlantic Ocean on the east. It is the third largest continent, covering 9,540,198 sq. miles. Located in the southern and western hemisphere, South America is the 4th largest continent in the world. In the northern hemisphere, too, a small part of the continent is present. Spread over an area of 5,400,000 square miles, Antarctica is the fifth largest continent in the world. It is also the southernmost continent of the earth. It is surrounded by the Southern Ocean and is located in the southern hemisphere. It is the driest, windiest, as well as the coldest continent. With an area of 3930519 sq. miles, it is the world's second smallest continent. However, it is one of the most populous continents on the planet. The world's smallest continent is Australia. One theory suggests that the continent only includes the Australian mainland and not the islands in the vicinity, like Tasmania or New Guinea. However, another says that these islands should be included because the geological landmass shared by them is the same. 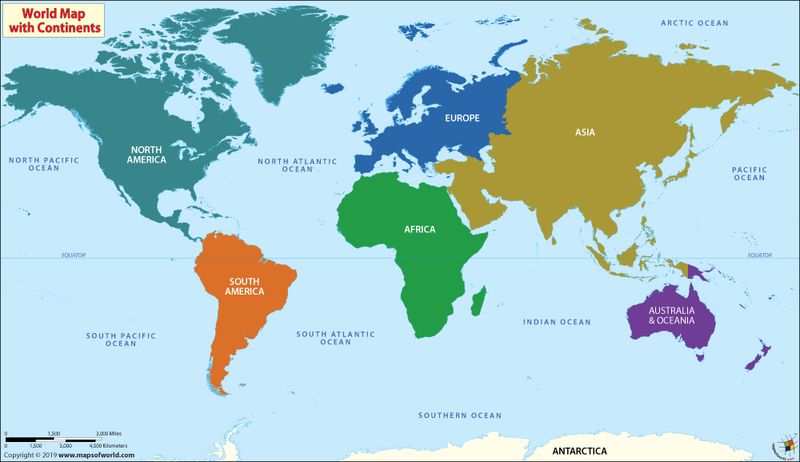 For a better understanding of each continent, refer to the various world continent maps that have been designed by Mapsofworld.com.